Review: Although I appreciated the first Battlefront with it's large amount of modes and solid multiplayer gameplay, it always felt like it could have done with a singleplayer experience, not that a game can't purely by multiplayer. T Luckily this time around EA's DICE have made a campaign mode for Battlefront II, Titanfall did much the same; multiplayer only in the first game, the went with an excellent singleplayer in the second. But where Respawn really nailed a great singleplayer in TF2, DICE struggles a little to make itself not seem like multiplayer game at it's core when playing the campaign. This review will solely be about that campaign, as I have not used time in the multiplayer. Gameplay is identical between the two though. SWBFII's gameplay is a solid DICE quality shooter experience, much like you'd expect from the developer behind the Battlefield games. The gun fights are satisfying and the sound is rich with a heavy weight to explosions. The TIE fighters scream like they are supposed to, making the spaceship battles a joy to play. I really enjoyed the diversions with controling various vehicles like the X-Wing and TIE fighters, as well as the imperial two legged walkers and four legged, giant AT-ATs. The view angle options though, to switch between third and first person when playing the main female character, Iden Versio, leaves me a little undecided. On one hand the third person view gives you a more personalised approach to the main character and actually seeing her gives the player a better connection. However, the animation of the characters look little clunky and the feeling of precise aiming when doing so seems somewhat lost. On the other hand you can switch to a precise first person view, probably the view intended when not playing as the famous Star Wars heroes, which are locked to third person. The first person mode is probably the best for the gun fights, but it kind of takes away the experience of being Versio. I'd like to see the third person view with more polished animation and settle for it being the default view. DICE absolutely nails the visual resemblance of famous Star Wars locations here; planet surfaces, small cities, space battles etc. it's a beautiful looking game and is spot on with movie aesthetics. The layout of the level design though, have this generic feeling to them and look like they're pulled straight out of the multiplayer levels design. The lack environmental interactivity is quite obvious too, when walking around in a walker or AT-AT blowing up enemies but hardly any environment. There's a barrel here and there to shoot, but everything else feels like solid concrete you can't damage. So while they have visually made the game look incredible at first glance, especially in 60fps and 4K on my Xbox One X combined with sharp image quality and detailed textures, the actual level design and interactivity needs work. I went into this game well aware that it had a short campaign and as such waited for a sale to pick it up, and although I've complained a bit here; I ended up having a fun and exciting playthrough. 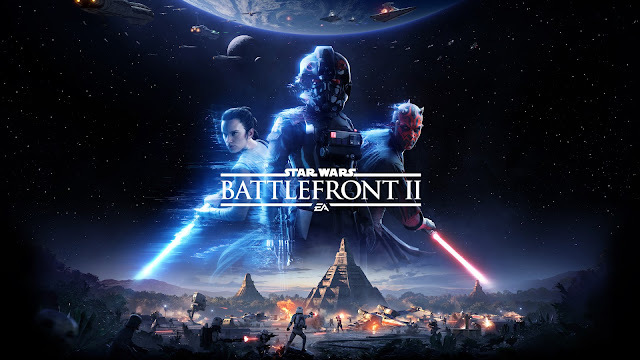 Playing as the dark side with Version is satisfying, and the levels in between with the famous Star Wars characters are refreshing and a entertaining distraction. Although the game should have ended at a point in the story and the stupid tie in with the new movies right at the end felt forced, it's a solid shooter for Star Wars fans. The way the game truly perfectly captures visual style of the old 70's style of the movies is fantastic, combined with how sharp and smooth it runs. Nothing revolutionary or out od the ordinary here then, but a solid shooter at heart.